In flight, the Paper Rokkaku flies steadily at low wind speeds then begins to swish from side to side in stronger breezes. Ready to see this little kite do it's thing? The movie clip further down was taken down at a local beach. The rough Moderate to Fresh breeze was not ideal, since it was coming straight up the beach - after passing over some large buildings and higher ground! Initially the kite had trouble staying up since Fresh gusts would force it down from time to time. However, no damage was done and the little Rokkaku did much better on a longer length of thread. The video shows how the kite got forced down low a few times but would always recover and soar back up again. I measured one gust at 37kph which is way above the 28kph maximum recommended for all the Paper Series designs! It's nice to know the Rok will take a little punishment in the air if the wind happens to really pick up. 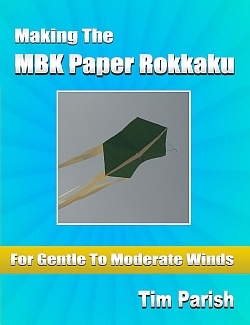 "Making The MBK Paper Rokkaku"
Knowing how to make a paper rokkaku kite is just a few minutes away now. You could have it in the air before the sun goes down. OK, maybe by lunch time tomorrow :-) You'll find it's a really fun little kite. To make and to fly.